You’ve already decided a custom flyer is a smart way to promote your business. Now, how do you decide which template to use? First, we make it easy to get started with our template library. We’ve already done the work of organizing templates into categories. Searching for ideas to promote your bar or restaurant? 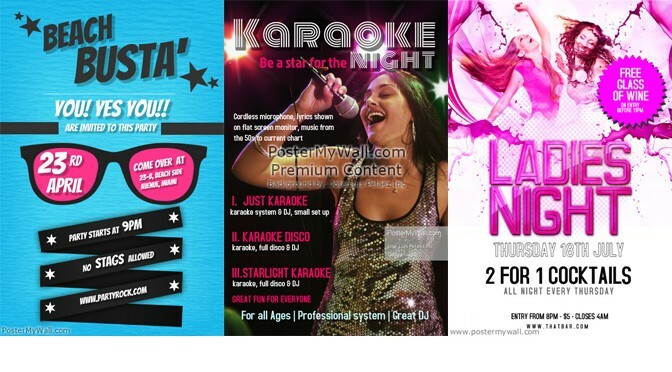 Then browse from Karaoke, Concert/Band, Party or Bar flyer templates. Next, think about how you’ll use the flyer. Will it be displayed or posted somewhere in particular? If so, make sure your flyer’s orientation fits the space allotted. Do you need a horizontal or vertical template? Don’t forget to consider the final size. We offer 4”x6” cards all the way up to 24”x36” posters. Flyers with minimal copy can work great at smaller sizes, whereas larger formats can typically support a bit more text. If you aren’t sure, 7.33”x11” is a solid choice to use. Nov 20 Black Friday, Cyber Monday... or Both?